Alleged online atheists love to link studies about atheism increasing worldwide. In the rush to give a big "ah hah" to theists, they fail to read the "fine print" of these studies, so to speak. These studies from the Pew do not state that atheism is on the rise. What they state is that the "nones" is on the rise. These "nones" are what the Catholic Church often calls the "indifferents." They are individuals who just stop participating in organized religion. This does not mean that they have become atheists or agnostics. In many cases, they do attend church services on Christian "high holy days" such as Ash Wednesday, Palm Sunday, Good Friday, Easter and Christmas. While this is a problem it is no indication that atheism is growing. These people have their reasons why they cannot live an active Christian life. The truth of the matter here is that atheism is on the decline. Pew studies have demonstrated that atheism will nearly disappear by 2050. It is nearly gone now in Russia. 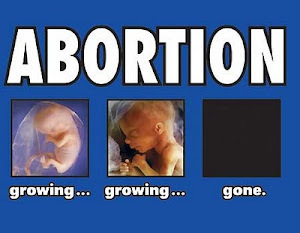 This decline is reflected not only in the statistics but also in real life. The so-called "Reason Rally" has failed twice already. The last attempt brought about just a few hundred people. Now, a big convention of atheists held in Australia has been canceled due to poor interest. The Global Atheist Convention which was scheduled to take place in 2018 and had on the bill big atheist keynote speakers such as Salman Rushdie, Richard Dawkins, and other science writers, activists, comedians and alleged ex-preachers was shut down due to poor ticket sales. You all want to read a 5,000-word essay on why atheist conferences are dying, right? That doesn't make sense. People attending the conferences years ago. They're not now. So something(s) happened. If you were right, they never would have attended at all. Atheists who have made atheism a cash cow are in panic mode. Dawkins, Hemant, Krauss, Hitchens, and others have made a fortune with the naivete of atheist sheep who blindly follow these charlatans. There are even amateur bloggers such as William Hounslow who pretends to be "Rosa Rubicondior," "Free Atheism," and "AtheismNTheCity" who I have been destroying recently on my site who has made money off atheist readers who do not think for themselves and do not bother to vet atheistic ideas against the facts. 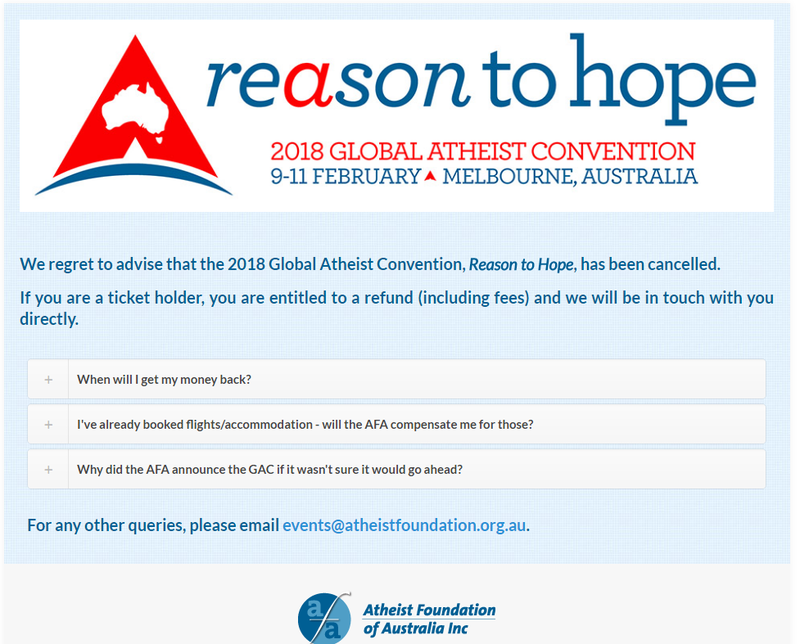 Ironically, the atheist convention in Australia scheduled for 2018 was coined or titled, "Reason to Hope." 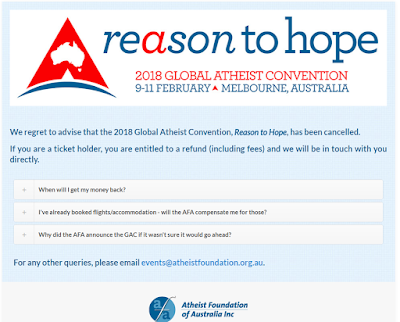 The convention's website states, “ticket sales have been substantially below expectations and below the levels for previous conventions, so, unfortunately, the Convention cannot proceed.” It seems that atheists do not have a lot to be hopeful about these days. I have noticed a decline in atheist activity online as well. In the past, my social media accounts have been bombarded by trolls pretending to be atheists. 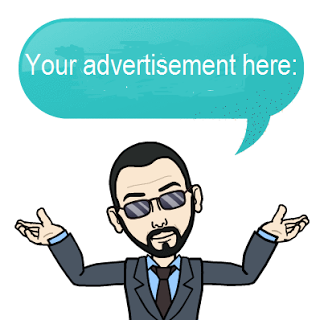 Today, I only get one or two messages criticizing my messages, myself or posts. Recently, Google restored my GooglePlus profile. In the past, I used to get a lot of messages and saw a lot of atheist activity in atheist communities. Now, I have noticed that about 10 posts daily. Many of the atheist trolls who used to target me for abuse are now missing in action. It seems atheism is dying and is dying fast. I have said it countless times. Atheism offers no substance or logic. There is nothing rational about it. While one can choose not to believe in God, this choice does not mean that God does not exist. This is the big problem with atheism. Atheism offers no evidence that would convince anyone that God is not real. All we see is anger, trolling, disparagement and misconceptions posted online. In universities, atheist clubs or organizations have become more like philosophy clubs rather than atheist ones. Topics in philosophy are discussed instead of diatribe against God and religion. The times are indeed a-changing. Atheism will eventually die because it is void of facts and purpose. Atheism is stupid. This is the conclusion I came to as a former atheist and why I wrote my book using this title. God and religion are hardwired into human beings. Atheism is an outlier in nature. It makes sense that atheism will not stick in society for long. 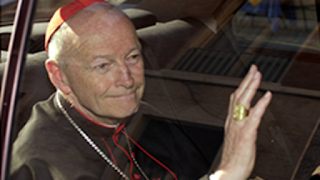 This is good news for us in the Catholic faith and in religion in general. We can take this time to reach out to these disillusioned atheists and invite them to give faith a chance. There is nothing to lose if they try.